The Energy Leadership Summit 2018 was a huge a success. We’d like to thank our co-hosts at NEBC, and all of our partners and sponsors. In case you couldn’t make it down to Seattle, here’s what you missed. Snohomish County Public Utility District (SnoPUD)‘s new CEO/GM John Haarlow kicked us off with the first keynote of the day. John, a former CleanTech Alliance Board member, talked about SnoPUD’s commitment to customer service. John’s speech also included a heartfelt section on the dangers involved in public utilities and how safety, i.e. ensuring your employees come safely, should be priority number one. He talked about how the utilities would be integrating new innovation and the need for new tools to serve customers better. You can find John’s slides here. This lead us into our first two rounds of panels. Follow the links to learn more about the Business, Policy and Innovation tracks. After two breakout sessions, it was time to announce our award winners. The Energy Leadership Achievement awards spotlights individuals and organizations that are making significant contributions to the fields of energy policy, innovation and business. We were happy to announce that the organization award went Spark Northwest, whose dedication to clean affordable energy is inspiring. 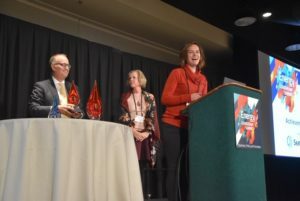 Jennifer Grove accepts the Energy Leadership Achievement Award on behalf of the Spark Northwest. Spark Northwest has continued to make impressive strides in advancing their vision of a Pacific Northwest in which every individual, regardless of income or race, has access to energy that is clean, affordable and local. They’ve had a direct impact on the region’s energy economy by working with over 135 communities across WA & OR to create green jobs and develop community-scale projects. Our other nominees, Boeing, the Alaska Native Tribal Health Consortium, and NW Energy Coalition are no less innovative or successful. We look forward to seeing how all the nominees will continue to demonstrate leadership in green sectors in the coming year. 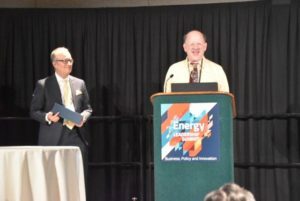 Dr. Michael Pomfret of the University of Washington and Washington Clean Energy Testbeds took home the individual award for his work mentoring the next generation of innovators that are already leading us to our greener tomorrow. As managing director of the Washington Clean Energy Testbeds, Mike has overseen the development of this open-access facility for prototyping, testing, and validating solar, battery, and system software/ hardware integration technologies, from construction, through opening in 2017, to tremendous first-year growth. In just under two years in operation, Mike has not only established a state-of-the art facility with amazing instrumentation and outstanding staff scientists to help users de-risk a cleantech concept, he has created a supportive home for cleantech innovators to grow and attract investors to our region. Other nominees included Membrion’s John Plaza, who has a track record of launching highly successful startups from the ground up, obtaining funding from leading private equity and venture capital firms, successfully growing operations, and structuring mission-critical partnerships and alliances. Cheryl Schell from Seattle’s Consulate General of Canada was also nominated for a more than 23-year commitment to green trade. She established B2B Commerce Connections to foster two-way trade between our region and Canada, and joined the Canadian Trade Commissioner Service in April 2014 taking over the sustainable technologies portfolio covering Alaska, Idaho, Washington, and Oregon. Finally, Tony Usibelli of the Washington State Department of Commerce was honored with the CleanTech Alliance Chairs’ Award for his 33 years of service and leadership in Washington, striving to help us all reach that cleaner future. 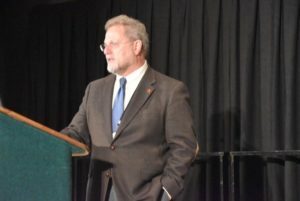 For years, Tony has worked tirelessly on an impressive list of green energy projects including the Western Climate Initiative, the Pacific Coast Collaborative, the Western Interstate Energy Board, National Emergency & Climate policy and a slew of both scientifically and politically sound legislation and ballot measures. Rarely has Tony Usibelli taken the spotlight, so the Energy Leadership Achievement awards were the perfect opportunity to spotlight just afew of his good deeds. Thank you, Tony, you earned it. UFA Venture’s Jim Conca takes the stage. UFA Ventures’ Jim Conca followed the award ceremony with a lively keynote over lunch on our aging energy infrastructure. It won’t surprise you to learn that our infrastructure is generations out of date, and if we want to stay competitive it needs an update. That said, upgrading the system is a great opportunity to make it greener. You can find Jim’s slide presentation, The Aging Energy Infrastructure, here. This led us back into our final round of panels. Check out these links for more on the Business, Policy and Innovation tracks. EPA vet Dennis McClerran closes out the Energy Leadership Summit 2018. 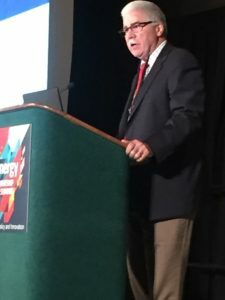 Eastern Washington native and Environmental Protection Agency (EPA) veteran Dennis McLerran closed out the ceremony with a fantastic keynote on the states’ responses to federal executive orders regarding climate change and energy. In an era where EPA protections have been rolled back and the President continues to assert that climate change is a hoax, local leaders like governors and mayors have risen to the challenge and taken the initiative on safeguarding the environment for present and future generations. 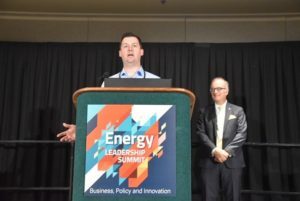 That was 2018’s Energy Leadership Summit. If you missed out, head to our events page for tons of other fantastic events presented by the CleanTech Alliance, our partners, and our sponsors that will tide you over until next year. In the meantime, thanks again to our board members and their organizations for their support and attendance. We’d like to extend a special thank to those board members who were able to attend in person – Reeves Clippard (A & R Solar Corporation), Curt Kirkeby (Avista Utilities), Susan Champlain (Boeing Company), Russ Weed (CleanTech Strategies), Cheryl Schell (Consulate General of Canada), Jimmy Jia (Distributed Energy Management), Andrew Vuong (Economic Alliance Snohomish County), Jameson Schwetz (Electrical Industry Group Northwest), Jenni Harper (Energy Northwest), Rick Luebbe (Group 14 Technologies), Callie Bendickson (Itron), Meeka Charles (JPMorgan Chase & Co.), David Benson (K&L Gates), David Allen (McKinstry), Susan Betcher (Perkins Coie LLP), Will Einstein (Puget Sound Energy), Justin Park (Romero Park P.S. 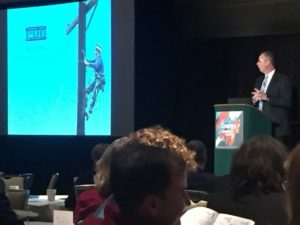 ), Craig Smith (Seattle City Light), Eric Moe (University Mechanical Contractors) and Dan Schwartz (University of Washington Clean Energy Institute). Thank you as well to the board members who could not attend but supported us by sending representatives in their place – Keith VanderZanden (Advanced Professionals & Benefit Solutions), Judith Estep (Bonneville Power Administration), Dave Curry (NextWatts), Malin Young (Pacific Northwest National Laboratory), Brian Young (Washington State Department of Commerce). We could not have done it without you. Please feel free to send any suggestions for improvements from this year or ideas for next year to Tom Ranken at tom@cleantechalliance.org.